Surrounded by dramatic mountains, including the UNESCO-listed Tian Shan Mountain Range, Lake Issyk-Kul is located in eastern Kyrgyzstan, close to the border with Kazakhstan. Being easily accessible from the capital, Bishkek, Issyk-Kul is a destination that finds its way onto many traveller’s itineraries. But, as an independent traveller, which part of the lake should you head to? We visited Issyk-Kul from Bishkek and travelled around it clockwise, stopping at three points: Cholpon-Ata on the northern shores, Karakol to the east of the lake and a spot close to Bokonbayevo on the south side of the lake. In this post, we will guide you around the lake and highlight our favourite things to do. 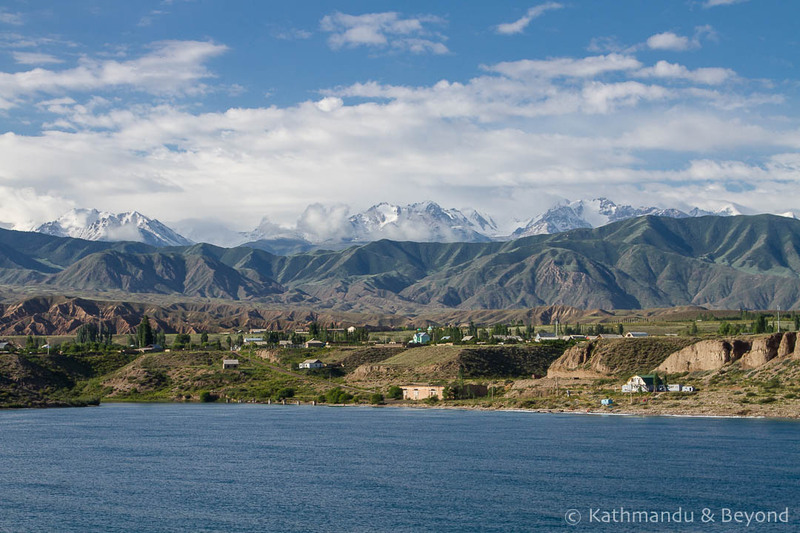 Issyk-Kul is Kyrgyzstan’s biggest lake and is the 10th largest lake in the world by volume (by area it ranks 25th). The lake is 182 kilometres long and 60 kilometres wide. Issyk-Kul is the second largest mountain lake, after Titicaca in Peru and Bolivia. Limnologists* believe the lake is 25 million years old. Issyk-Kul’s high mineral content means the water isn’t drinkable. However it is used to treat various illnesses, and Cholpon-Ata is a well-known medical spa town. Issyk-Kul means ‘hot lake’ in Kyrgyz: even though wintertime temperatures can fall to -5 Celsius the lake never freezes. It’s an endorheic lake. Yes, we had to look that word up too! Basically, it means that water from rivers and streams flows in, but not out and evaporation controls the water level. Other examples of endorheic lakes are the Dead Sea, Lake Eyre in Australia, the USA’s Great Salt Lake, Lake Atitlan in Guatemala and the Caspian Sea, the world’s largest endorheic lake. *Limnologist = fancy word for a person who studies lakes and inland waters! 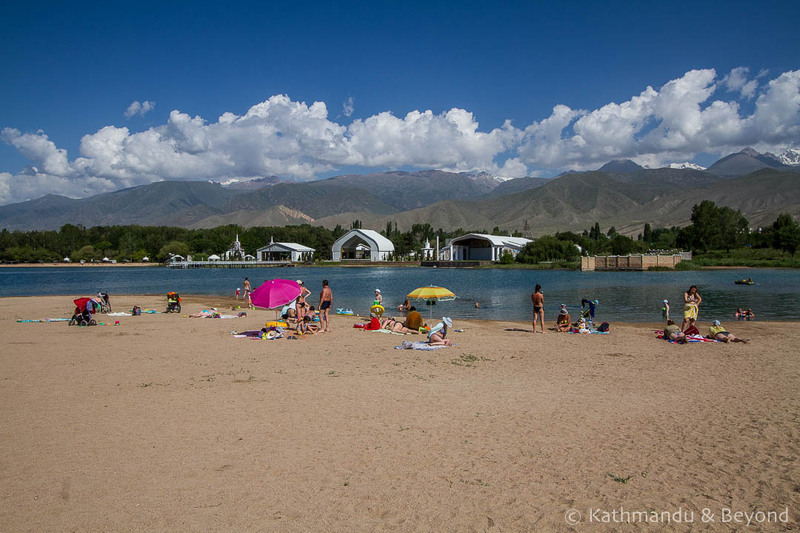 Due to its prominence as a popular resort for tourists from Kyrgyzstan and neighbouring Kazakhstan, Cholpon-Ata is the best-known town on the lake. Because of this, it has a more commercial feel than other places around the lake. Cholpon-Ata is a sprawling, medium-sized town with a busy main road running through it, although the streets leading from the road towards the lake are far more pleasant. Most tourists go to Cholpon-Ata to drink beer and play in the sun, so if you do decide to check out any of the thin smattering of cultural attractions, chances are you won’t find many other visitors at them! This is the rather long name given to the plains on the rolling hills above the lake, which are designated as a government-protected nature reserve. Sometimes called the Petroglyphs Nature Reserve, the fields are strewn with prehistoric rocks, many of which are adorned with petroglyphs. The site covers a large area and at the entrance, there is a somewhat battered information board with suggested walking routes taking between 30 minutes and 3 hours. We attempted to follow one of them but the path was undefined and we only found a handful of petroglyphs, many of which were quite faded. Despite not being wowed by the rock carvings, we did enjoy the landscape and thought the low, lichen-covered boulders very photogenic. In case you’re trying to figure out the difference between petroglyphs, pictographs and hieroglyphs; petroglyphs are rock carvings made by chiselling an image on a rock surface and are usually associated with ancient civilisations whereas a pictograph is a pictorial symbol for a word or phrase and a hieroglyph is a stylised picture representing a word, phrase or sound. On the recommendation of Aim at Apple Hostel where we were staying, we took a taxi to the site (cost 150 soms / approximately US$2) and then walked downhill back to the lake after our visit. Officially there is an entrance fee to the site but on our visit, the ticket booth was deserted, as was the entire site. Win to us. 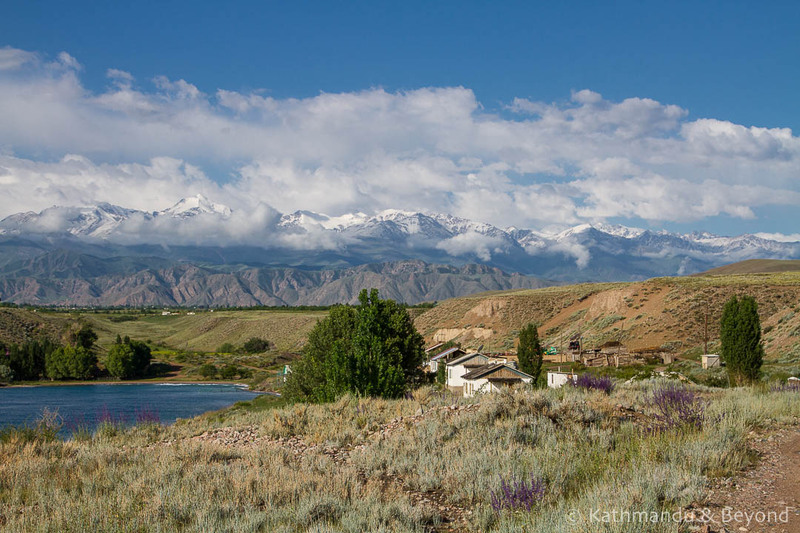 Most tourists go to Issyk-Kul for a beach holiday, but even though it was mid-July, the temperature wasn’t warm enough to tempt us to strip off and take a dip, so we settled on admiring the lake view with its backdrop of snow-capped mountains. There are several accessible beaches and coves along Cholpon-Ata’s shoreline which involve a 15-minute-plus walk from the town centre. Before arriving in Cholpon-Ata we had envisaged a scenic lakeside setting, but the slightly jumbled urban landscape doesn’t allow this and we found ourselves walking through wasteland and construction sites much of the time. The walk around the circular headland that juts out from the lake wasn’t enjoyable so we aborted it and contented ourselves with people watching. Not something we tried, but plenty of people go to Cholpon-Ata either to convalesce or have medical treatments using the mineral-rich water. We stayed at Apple Hostel in Cholpon-Ata which is the sister hostel to the Apple in Bishkek and we got a discount for staying at both. It’s a small hostel with dorms only – the dorms are small four-bed rooms with a shared bathroom for two rooms. We got lucky and had a four-bed dorm to ourselves. The woman running the hostel was lovely and very helpful but one thing that let Apple down was that the kitchen and the place, in general, was dirty. The location was convenient for transport links, being on the main road, but it was quite a long walk (around 15-20 minutes, depending on how long you get lost in the maze of backstreets) to the lakeside beach. Other travellers we met recommended Tan Nuru Guest House, which has private rooms for a similar price. OUR TIP: If being close to the beach is a priority, choose your accommodation carefully to avoid a long walk. Cholpon-Ata gets mixed reports from fellow travellers: ’it’s too touristy’ is the usual complaint. Whilst we enjoyed our stay, it’s not a place we’d rush back to. 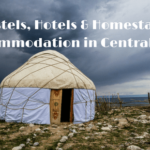 It has a decent choice of accommodation and plenty of places to eat and drink, and seeing the Kyrgyz and Khazaks on holiday does show a different perspective on local life. 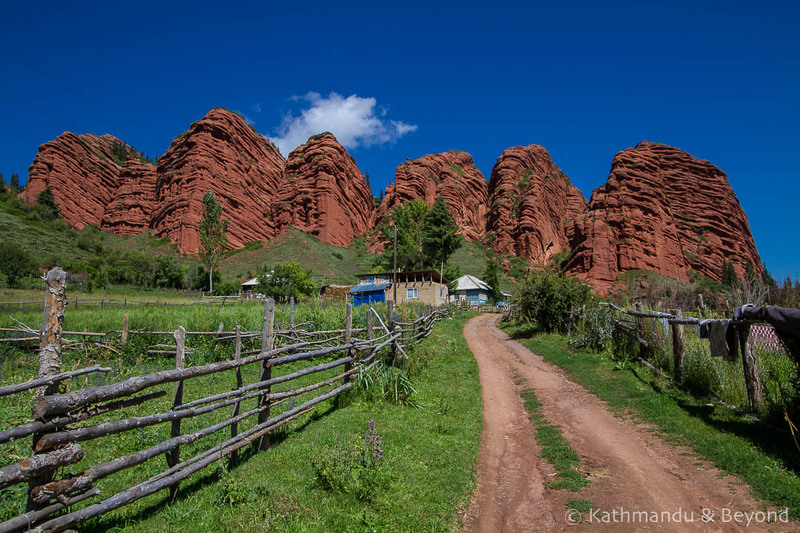 It might be fun for a few days, but if you have limited time in Kyrgyzstan and are more interested in scenery and experiencing the great outdoors, Cholpon-Ata might not be for you! We’re happy we visited Cholpon Ata if only to satisfy our curiosity that there aren’t many reasons to go back. 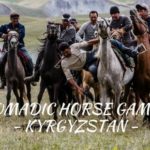 The only likely one is to attend the next World Nomad Games. 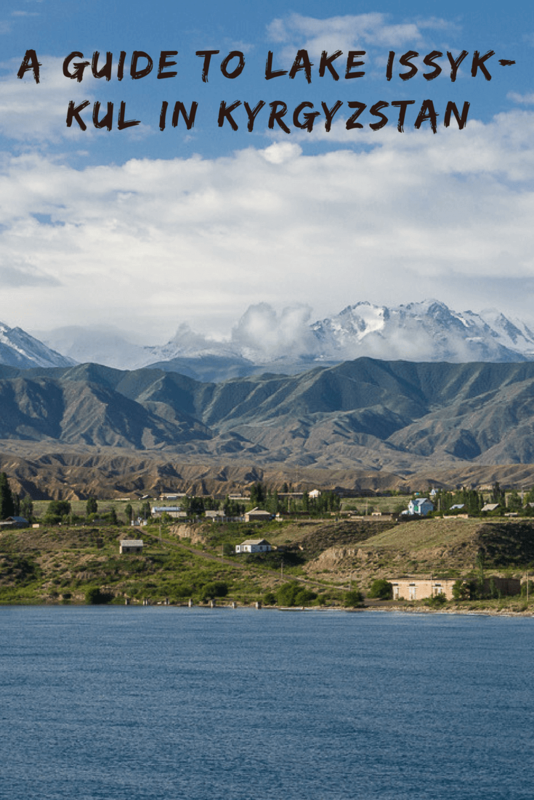 Once a Russian colonial outpost on the fringes of the Tsarist Russian Empire, the small town of Karakol is located on the eastern side of Issyk-Kul lake, but don’t mistake it for actually being on the lake. I say ‘small’ town but Karakol is actually Kyrgyzstan’s fourth largest city with a population of around 70,000. By contrast, Bishkek’s population is 900,000. Although Karakol has a fairly compact centre, there’s not a lot there and most of the accommodation options are spread out across the residential streets leading up the hill away from the town. There are a lot of traditional white-washed timber houses on these quiet streets which are worth a wander and a gander. We struggled to find decent eating options and were grateful that our guesthouse was equipped with a good kitchen (although it was also an effort to find a well-stocked supermarket!). 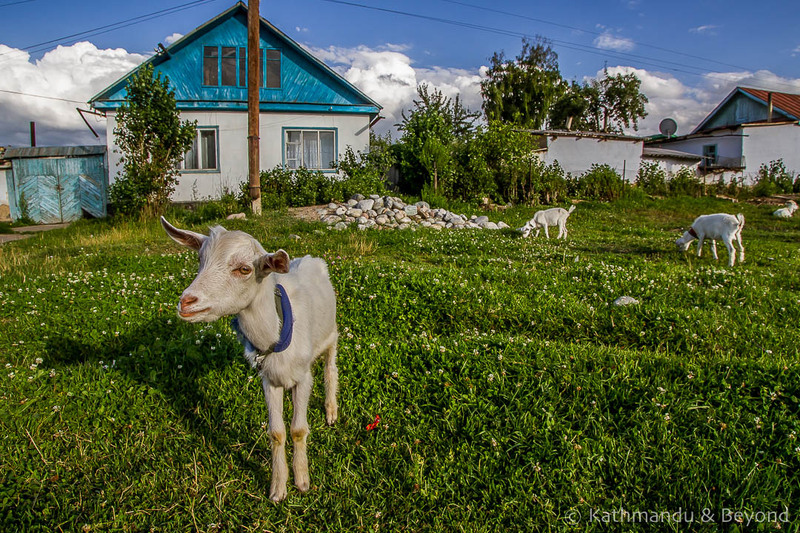 There aren’t many sights in Karakol itself, but it makes an excellent base for exploring the surrounding area and has some of the best accommodation we experienced in Kyrgyzstan. The towns pretty wooden Holy Trinity Cathedral was built in 1895 and it’s worth stopping by for a quick look. It’s located near the centre of town. Other than that, you can track down the town’s obligatory Lenin statue, buy some delicious fresh Kyrgyz bread at the market, and have a drink at Karakol Coffee. Jeti-Oguz is famous for its mineral-enriched hot springs and nearby is the ageing Jeti-Oghuz Sanatorium. It was built in 1932 and doesn’t look like it’s had much in the way of a facelift since then although apparently it still operates as a health resort. Depending on time and inclination, we recommend a stroll around the immediate vicinity and that you walk up the hill opposite the Seven Bulls for a panoramic view. If you’ve got more time, follow the stream through the gorge towards the Valley of Flowers, known locally as Kok-Dzhayyk. TIP: There are a couple of small shops in the car park area, but you might want to bring a packed lunch or at least some snacks. 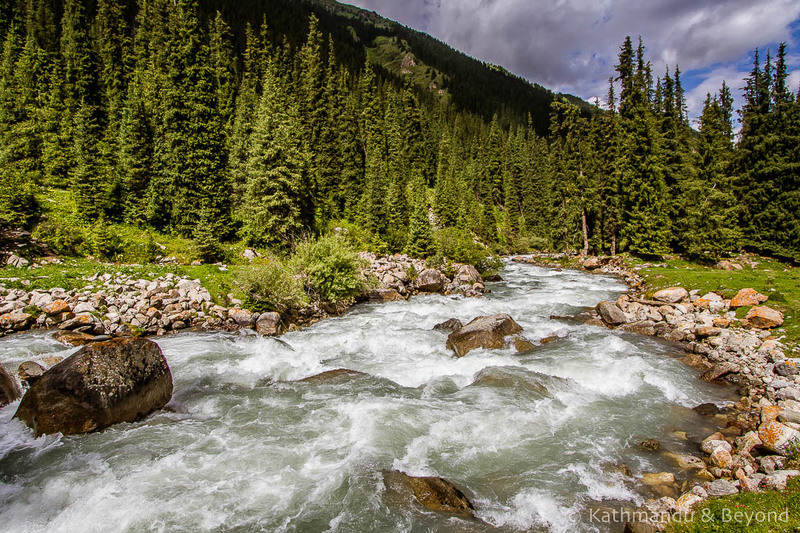 The drive from Karakol to Seven Bulls takes approximately 40 minutes by car. Reportedly, it is possible to take a shared taxi however we failed to find anyone else waiting at the designated spot near the market to do the journey and so ended up paying 500 som (US$7) for a private taxi there and negotiating 400 som for the return journey. In hindsight, we should have saved a lot of time and effort and just paid the 1200 som offered by our guesthouse to arrange a taxi for us! NOTE THE NAME: The location of Seven Bulls is known as Jeti-Oguz Korort. It’s important to include the Korort part when taking a marshrutka or negotiating with taxis or you might end up in the settlement of Jeti Oguz, about 10 kilometres short of your destination. This weekly animal market is found on the outskirts of town and is the go-to place for trading sheep (including the fat-bottomed variety), goats, horses and cattle. 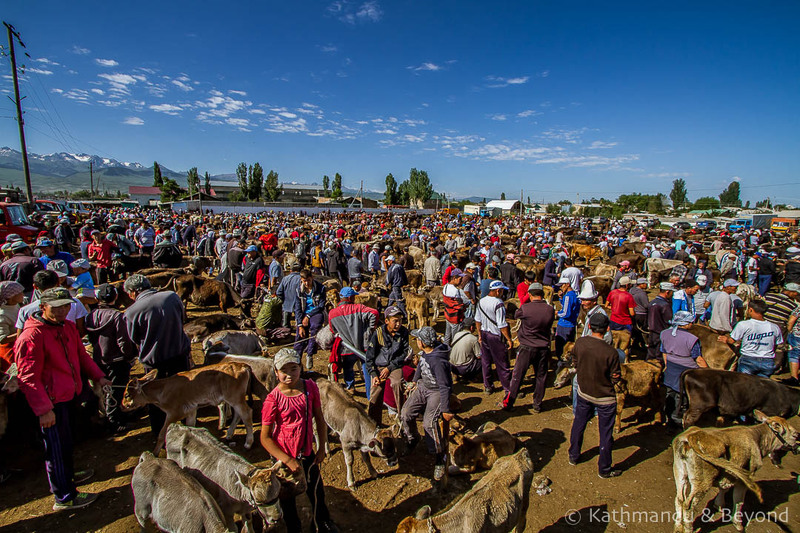 It’s the biggest of its kind in Kyrgyzstan and possibly in Central Asia – we felt it rivalled the famous animal market in Kashgar (which is ethnically Central Asia even though geo-politically it’s in China). The action starts early and is packed up by 10 am so don’t lie in bed too long! 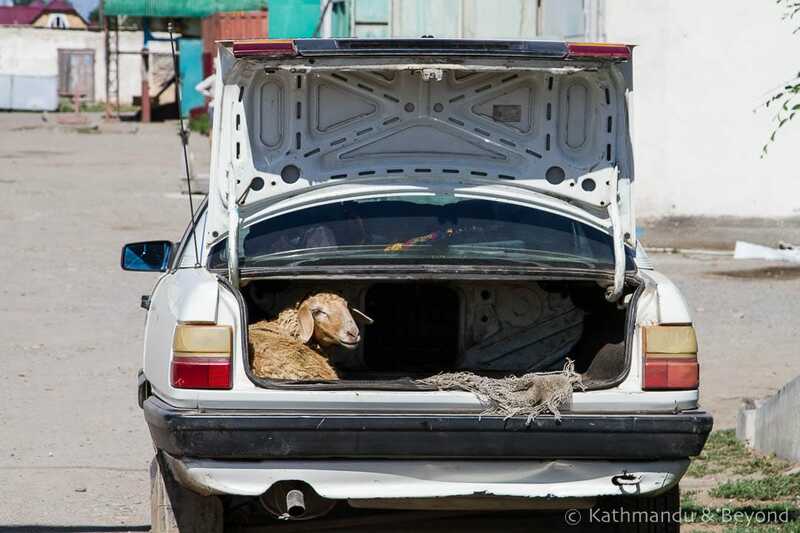 Seeing sheep and goats being stuffed in the boot of a Lada was a pretty surreal sight! You can, of course, take a taxi to the animal market, but it’s also very easy to take public marshrutka number 102. The shared minivan stops on the edge of the market and from there you really can’t miss it. Just follow the crowds to the neighing and baa-ing. It’s also possible to walk to the animal market: depending on the location of your guest house, it should take approximately 30 – 45 minutes. 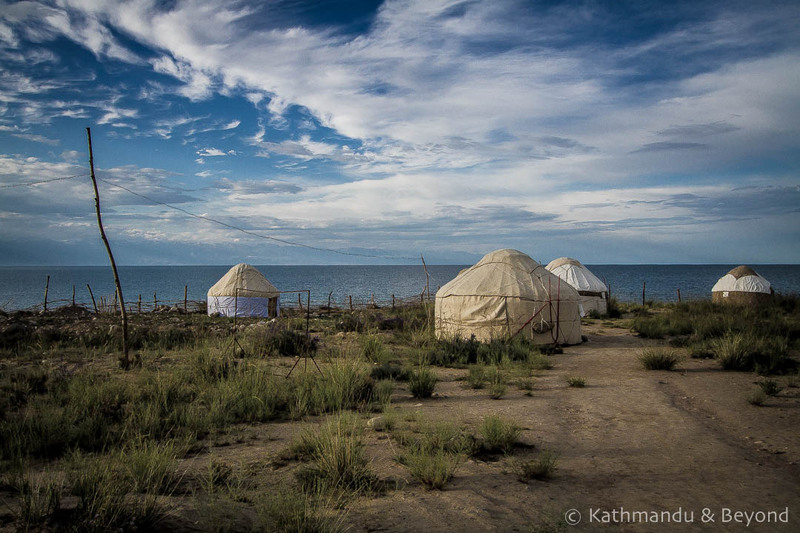 Although the lake isn’t particularly close to Karakol, it is possible to make a visit from town. As we’d already spent time on the north shore of the lake at Cholpon Ata and were also planning to stop on the southern shore, we decided to skip the visit from Karakol. We stayed at Bed & Breakfast Nice, a guest house that truly lived up to its name! Family-run Nice B&B is one of our all-time favourite places we’ve stayed. The family running it is lovely and friendly and they speak great English too! Rooms are spotless (all rooms are private, no dorms here) and there is a huge, full kitchen which guests can use. We’d say, it’s still worth it but if Nice is a little beyond your budget, they also own a hostel a short walk from the guest house. A couple we met whilst in Kyrgyzstan also recommended Memo’s Guest House. 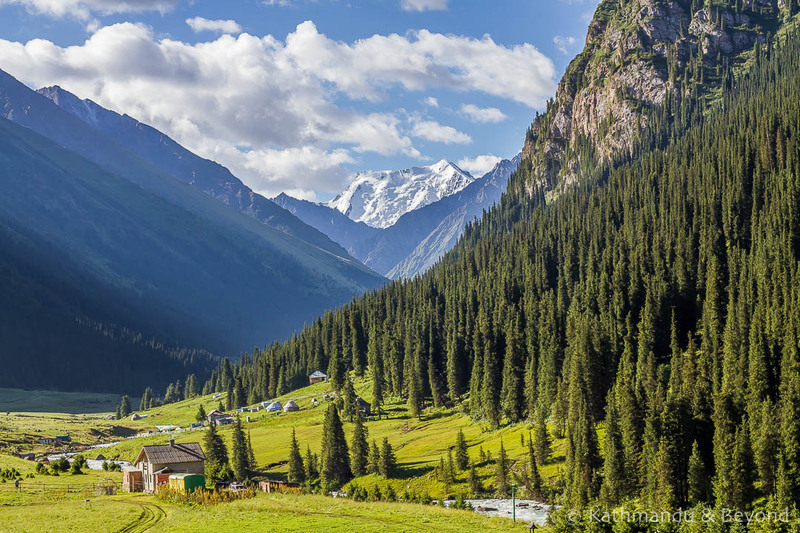 Many travellers use Karakol as a base for hiking into the surrounding countryside. The most popular treks are the hike to the hot springs at Altyn Aarashan and the trek to Ala-Kul, an alpine lake at an altitude of just over 3500 metres. It’s also possible to undertake longer treks that include Jeti-Oguz and take a week or longer. With unreliable weather and ever-conscious of Kirsty’s weak knees, we decided to trek to the hot springs at Altyn-Arashan. The hike was relatively easy and it took us less than 5 hours at a fairly leisurely pace to cover the 14 kilometres to the meadows of Altyn-Arashan. The walk wasn’t too steep, mostly following an extremely bumpy 4WD track although, because of earlier rain, it was a bit muddy in parts and entailed jumping a couple of streams to avoid wet feet. 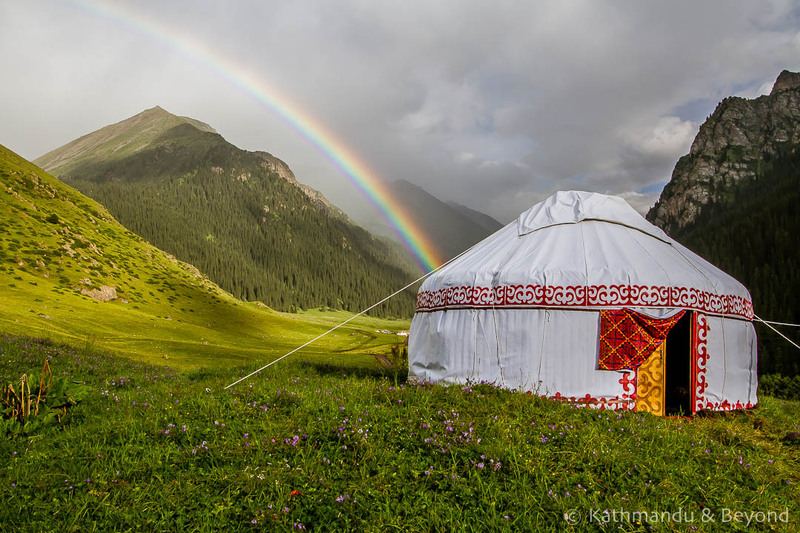 We’d experienced dry and relatively sunny weather throughout our trek but as we reached the small settlement of Altyn-Arashan, the heavens opened and we quickly found a yurt camp on the broad meadows before retreating to the dining tent for some hot soup. A little later, as we sat chatting and drinking tea with fellow travellers, the sun pushed through and we were greeted with an amazing double rainbow. If it hadn’t been raining and the meadow hadn’t been a boggy marsh, and we’d been better prepared, we would have stayed another night and done the full day hike through the valley to the glacier at the foot of Pik Palatka. This is a good option for walkers who don’t want to tackle the tricky scramble across the glacier necessary in the circular Ala-Kul Lake trek (see below). Home to hot springs of the same name, Altyn-Arashan is merely a settlement of a handful of places to stay; don’t expect a village or any other amenities. There is only a smattering of sleeping options, and camping is also possible. Although our guidebook stated there are only a couple of places to stay, there are now at least five accommodation options at Altyn-Arashan. Shaktybek at B&B Nice in Karakol recommended Guest House Ala-Kul but when he phoned to check if they had a room available, they were expecting a large group so couldn’t accommodate us. Reaching Altyn-Arashan, the first place we saw was a smart looking yurt camp on a small hill to the left. We bypassed it and next came to Guest House Ala-Kul on the right. We had a quick look in case they had a room but the staff, who were busy preparing a mountain of food, confirmed they were fully booked that night. It turned out that the very lovely Yurt Camp B&B Cholpan didn’t break the budget at all, and we should have just checked this place at the outset! Our cosy private yurt cost 500 som (approximately US$7). Lunch and dinner cost 200 som per person and breakfast just 70 som. That equates to US$15 half board for two people. The yurts were clean and cosy with thick sleeping mattresses and plenty of bedding. There was a clean pit toilet, and a sink for teeth brushing and face washing but no shower. Remember though, the famous body-cleansing hot springs are only a short walk away! There was a dining tent where hearty meals were served and we could also buy a beer from the sweet family who ran the place. If the weather was better, we’d have probably stayed another night just to chill out. Yurt Camp B&B Cholpan: Erm, no email, Wi-Fi or phone signal here, you’ll just have to hope there is room at the yurt at the end of your trek! B&B Cholpan is the first yurt camp on the left as you enter Altyn-Arashan when walking in from Ak-Suu or the last place if you are walking from Ala-Kul. Guest House Ala-Kul: You could try checking availability via their Facebook page or by telephone: +996 703 100 550. Or just pitch up. Talking of pitching up … the guest houses all have space to put up a tent if you’re camping. Take marshrutka number 350 (50 som) from Karakol to the village of Ak-Suu. Tell the driver you are going to Altyn-Arashan and he will make sure you get off at the right place. You can, of course, also take a taxi. From the drop-off point, take the trail to the right and follow it up! The track is fairly easy to follow and from the online information we read beforehand, the best bit of advice came from Hitch-Hikers Handbook: After 3km, cross the river (from the right bank to the left). After that, you will not cross the river again. At 12km the path becomes a little confusing but stay left, up and away from the river – don’t cross it. 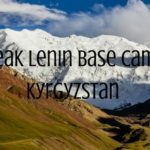 The full article which has a useful account of the hike can be read here: Altyn-Arashan, an easy hike near Karakol. 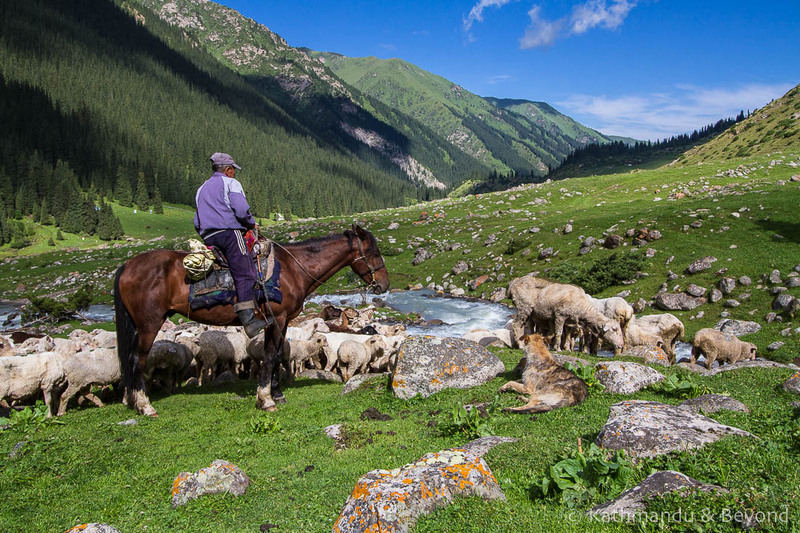 TIP: Kyrgyzstan has a relatively short optimum trekking season with July through to mid-September being ideal and you shouldn’t tackle the Ala-Kul trek alone outside of this time frame as conditions can change quickly. In some areas it may be possible to hike from mid-May until mid-October, although the weather is more unpredictable: it gets cold and there may be some rain. Yes! We really enjoyed our time in Karakol. Even though the town’s attractions are quickly exhausted, there is a lot of diversity in the surrounding area. Karakol also has some of the best budget accommodation we experienced in Kyrgyzstan. Bokonbayevo is a fairly nondescript typical Kyrgyz town but it’s a good base for exploring lake Issyk-Kul’s southern attractions. The marshrutka stop is next to the CBT (Kyrgyz Community Based Tourism Association) office and someone representing either CBT or one of the other tourism agencies in town is sure to find you. The town is a few kilometres from the lake and we opted to stay in a more rural setting, near the village of Tong in a yurt close to the lake shore. Other travellers choose to make Tamga their base but if you want to organise trekking, horse riding or other excursions independently of your guest house, Bokonbayevo is the best place to do so. Two women who we met at Bel-Tam Yurt Camp had arranged for a taxi to take them to two nearby attractions and asked if we’d like to go with them and share the cost. We visited Fairy Tale Canyon to the east and Shor-Kol salt lake west of Bokonbayevo. The cost of the transport was 2600 som (approximately US$36) shared between the four of us. 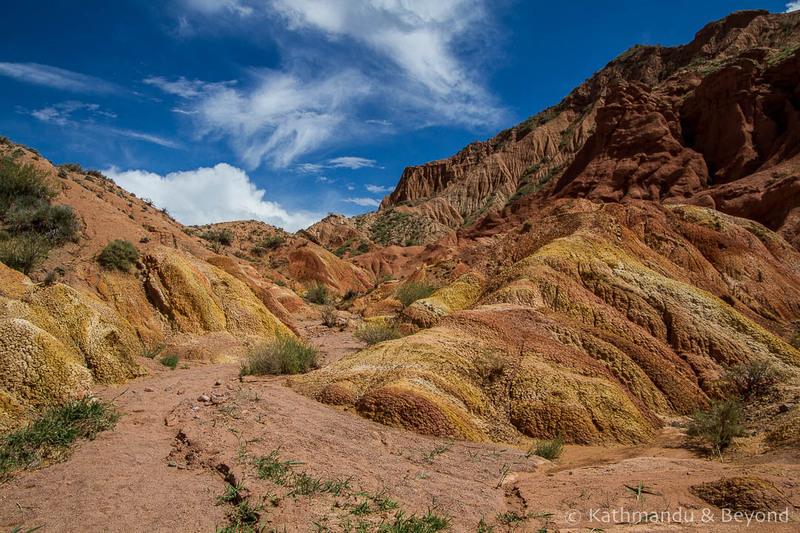 Known as the ‘Dead Sea of Kyrgyzstan’, the visit here was more novelty value than anything else. Locals flock to the salt lake which has a similar buoyancy to the Dead Sea. 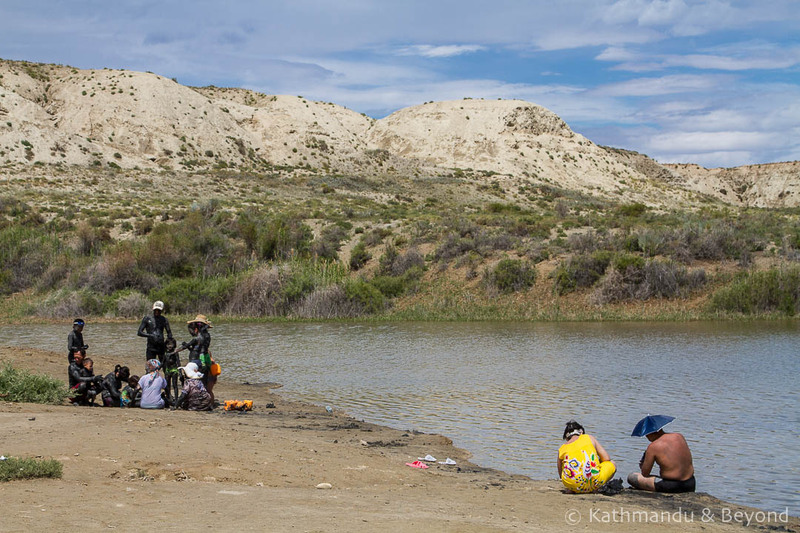 As a bonus, the lake floor is made of purifying mud which visitors smear over their bodies before lying in the sun to bake. When the mud cracks, it’s back into the lake to attempt to wash it off. It was a slightly surreal sight but the surrounding scenery was very pretty! Entrance fee: 100 som (US$1.40 per car). Named after the fanciful formations the rocks supposedly represent, Fairly Tale Canyon is set back from the lake down a dirt track. Our car drove us just over 2 kilometres and from there we explored the orange and red rocks on foot. You can only walk so far but the bright colours contrasted with the rolling green hills and deep blue waters that we had seen in Kyrgyzstan until now. Climb up some of the higher ridges for fantastic views of the lake and snow-capped mountains beyond. Entrance fee: 200 som per car (US$2.80). Bel-Tam Yurt Camp sits directly on the shores of lake Issyk-Kul and is perfect for a dip in the lake or a stroll around the lake shore and beyond. Horses aren’t for us, but some other travellers arranged horse treks using Bel-Tam Yurt Camp as a base. The southern shores of Lake Issyk-Kul around Bokonbayevo are often promoted as offering a more authentic lake experience and the area is certainly less developed than Cholpon-Ata. We stayed at Bel-Tam Yurt Camp, a short taxi ride from the town of Bokonbayevo near the village of Tong. We booked our yurt via the CBT office in Bokonbayevo and they also arranged for a taxi to take us the 7 kilometres to the camp (250 som / approximately £3/US$3.50). We were assigned a yurt close to the shore. This definitely afforded the best views of the lake but the downsides were that is was further away from the shared bathroom and also didn’t have any electricity, unlike many of the other yurts. The ‘bathroom block’ at the camp is equipped with western-style toilets and solar powered hot water showers (the temperature is a bit dependent on the time you shower!). Meals were standard Kyrgyz yurt fare and quantities were plentiful. We paid 2,100 som for half board/two people (approx. £24 / US$30). You could save $5 each by not having dinner, but the camp is pretty remote and there aren’t any other options nearby. Beer and soft drinks were also available. No Wi-Fi. Some travellers opt to make Tamga their base so if you want to check out other options in the area, click here. 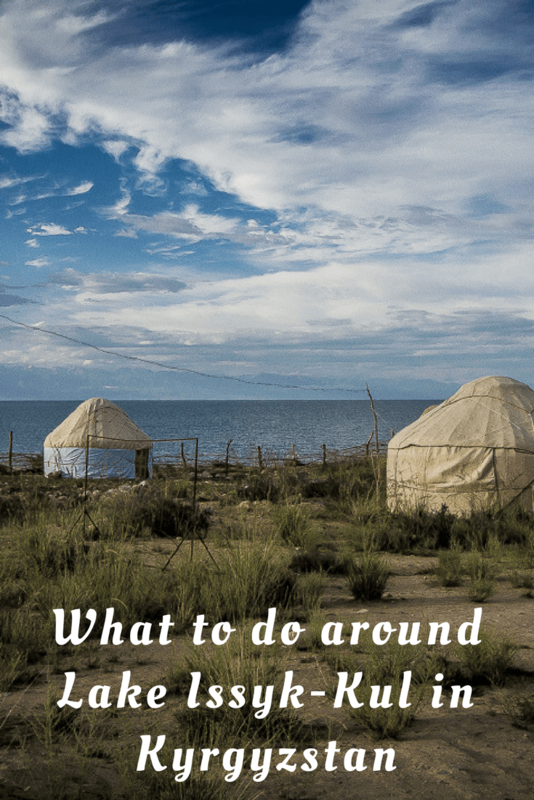 Is Southern Issyk-Kul worth it? This part of the lake is wilder than the northern shores and makes for a stark contrast to Cholpon-Ata. Travellers more interested in the natural beauty of Kyrgyzstan are likely to prefer this side of the lake as it is less developed than other parts. We travelled around Issyk-Kul by public transport, taking marshrutkas via the northern route from Bishkek to Cholpon-Ata, and onwards to Karakol. From Karakol we continued along the southern route by marshrutka first to Bokonbayevo and ultimately back to Bishkek. Shared taxis also run along these routes, but the marshrutka worked out fine and is by far the cheapest way of getting around the lake. If you have a week or more to explore Lake Issyk-Kul, we would recommend following the same route that we did. Whilst many would argue Cholpon-Ata is not ‘the real Kyrgyzstan’, your transport will most likely pass through so you may as well spend at least a night there and experience a different facet of the country! 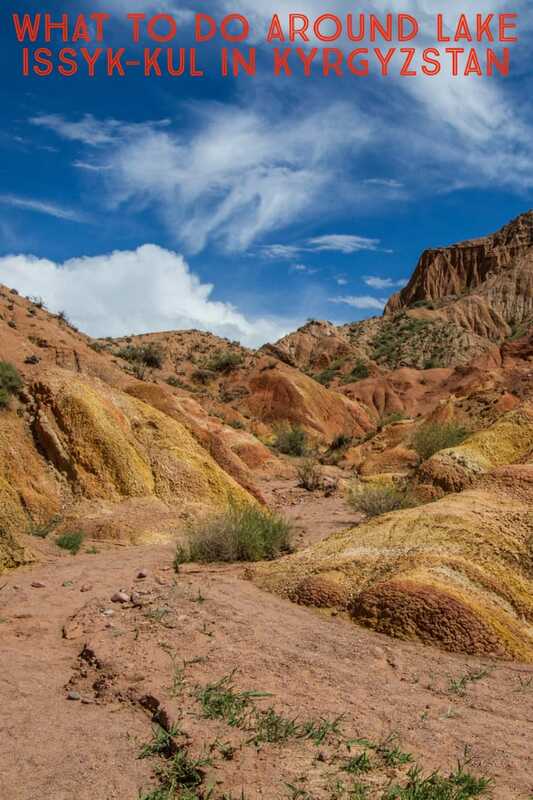 We spent 12 days in the Issyk-Kul region but this could comfortably be cut down to a week if you only plan to do a short hike, or increased to two weeks or more for a longer trek. NOTE: It’s only necessary to start this itinerary on a Thursday if you want to coincide your Karakol stay with a visit to the Sunday animal market. 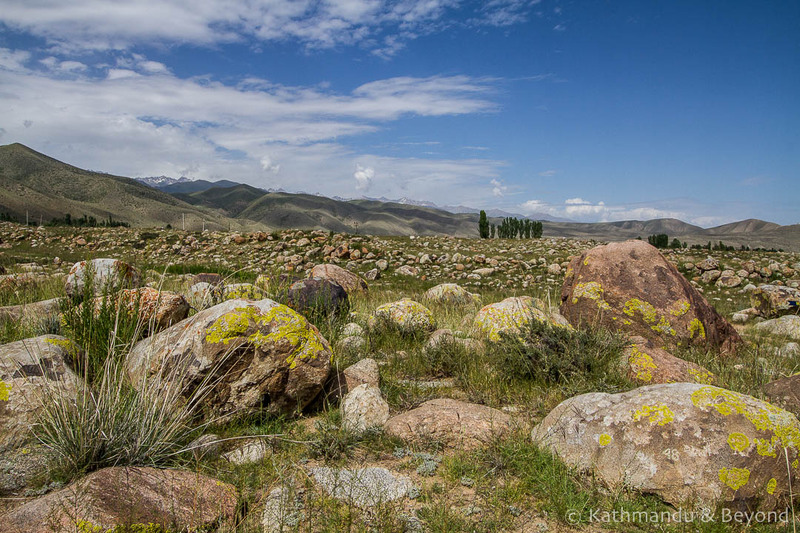 Thursday Day 01: Bishkek to Cholpon-Ata for two nights. Friday Day 02: Day and overnight in Cholpon-Ata. Saturday Day 03: Travel from Cholpon-Ata to Karakol for two nights. This afternoon explore the town and make any preparations for your hike. Sunday Day 04: Early morning Sunday animal market. After visiting the market, continue to Jeti Oguz. – If you only want a quick glimpse of Cholpon-Ata, leave early from Bishkek and spend just one night there. 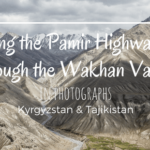 – Add a night at Altyn-Arashan to do a day hike or do the 2-nights Ala-Kul lake trek. Looking for more information? 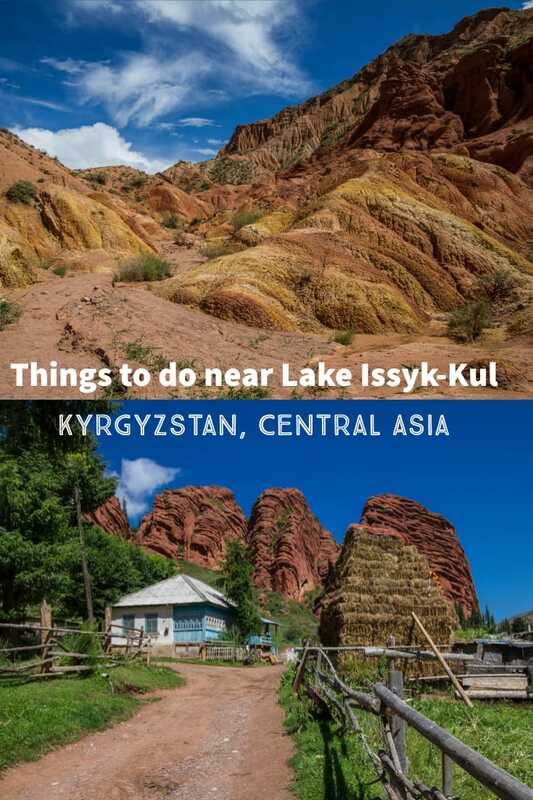 Lonely Planet has recently released a brand-new Central Asia Travel Guide – They also currently have an awesome offer, so if you’re planning a big trip… get shopping! You captured wonderful pictures in your travel trip. I really like the beauty and nature of that place. Great post! Thanks for sharing it. Thanks for the very well documented article.